The Low Angle Jack Plane is ideal for shooting mitres, working end grain and initial smoothing. Veritas have designated it as a 62 1/2 because of its generous size, greater weight, low centre of gravity and radically set-back mouth. Measuring 380mm(15") long and 57mm(2.1/4") wide, it weighs just under 2.72kg(6lb.). With sides machined square to the sole, a specially shaped lever cap and machined thumb recesses on each side, it provides both comfort and excellent control when shooting. Includes a lapped 25° bevel blade, 57mm(2.1/4") wide, 4.8mm(3/16") thick, the lapped blades have a flatness tolerance of ±0.005mm or better over the working surface, and with an average roughness surface finish of ±0.0127mm (0.0005") or better. 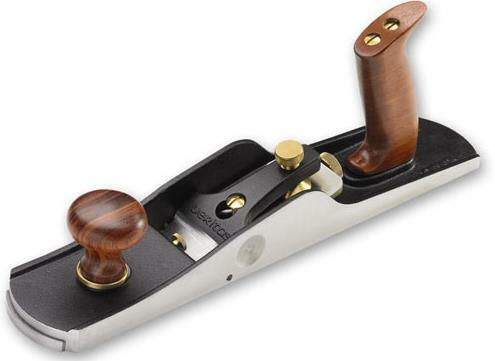 A refined plane for the discerning woodworker.